We loved our stay here! The staff were wonderful and very welcoming, it had a great central location (hence the name lol) and the facilities were very nice. The staff were very helpful and took extra steps to make sure that we were safe and knew how to avoid pickpockets. They also took us to the magic fountain on Friday night after a dinner made by the owners at the hostel - so good!! Best hostel in the whole world. Shout out to Alessia & Mirco for running a tight ship, and to Eszter, Alice, and Mora for always killing it. Thanks for the dinners and the laughs and the easter egg. I had a perfect stay at this place for 4 nights. It all started with a good email 1 day before arrival with a lot of tips and tricks. The welcome by the staff was awesome. The room was ok. The atmosphere was perfect. They know what travelers want and offer the right stuff. Perfect storage of luggage after checkout. Good kitchen and common room. Very nice "garden". When i'm back in Barcelona i'll definitely stay here again. This has to be one of the best hostels I've ever stayed at. The staff are welcoming from the moment you arrive until you leave. The place is clean and kept that way. Security is not a problem either. As there is staff there 24/7. The staff are very knowledgeable about the city and where and when it's the best times to visit. Transportation is superb which makes the city easy to explore. Good food abounds in the city also. From tapas and all day snacks to a la carte menus. Simply a must visit. Probably the best hostel I have stayed in! Staff is super friendly and inviting. They really do a great job helping you out with whatever you need. Location is perfect and very accessible by train or bus. Hostel is super clean and well put together. Would 100% stay again! I had a great experience with this hostel and the staff that work for it. 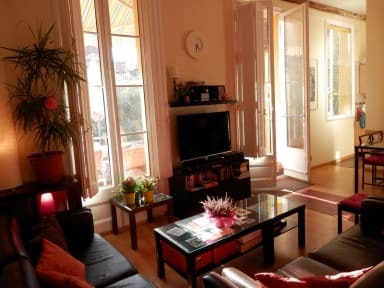 The hostel is in a beautiful location in the heart of a very exciting area of Barcelona. It has a very Mediterranean-Barcelona vibe with balconies and courtyards to spend time in. The facilities are clean, the offer laundry services, and a staff members is available 24/7. They organize a community dinner twice a week, and explore Barcelona together as well. If I had any issues, it would be that my room was a little stuffy. 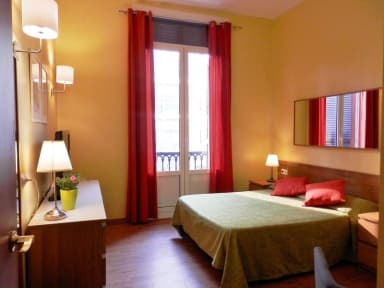 Barcelona Central Garden is a fantastic hostel if you are looking for some peace and quiet or a place to recuperate after a long day of site-seeing. The front desk is open 24 hours, the laundry service is inexpensive, and the staff is incredibly friendly. The showers have amazing water pressure and the back yard is a wonderful place to enjoy a beer or read a book. This is NOT a party hostel. They have a curfew and adhere to it which is exactly what I was looking for after a long weekend. It’s a cute little hostel in the heart of the city. Kinga was really helpful during my check-in. They have organised events like flamenco night (I opted out as I had already made plans). There is a place just next to which has nice variety if cooked meals on decent prices. The only negative things I can mention were the squeaky door, was annoying to wake up every time someone opened it, and the springs in the bunkbeds are getting worn out and they squek whenever you turn. But overall good stay!